Get Your Own Plastic Photo Jigsaw Puzzle! To make your own jigsaw puzzle, you should define the size of the jigsaw on the very first hand; then you have to choose an interesting photo or artwork that can fit in the puzzle. Got bored? No worries, take out the puzzle, start the brainstorming and play the most exciting game ever. Plastic jigsaw puzzles can be used by kids and adults alike as they are designed to be the most exciting game tool for everybody. 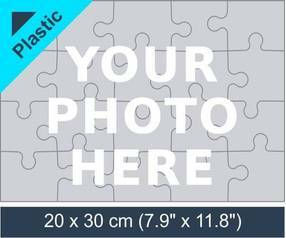 Make your plastic photo jigsaw puzzle by choosing the jigsaw size and upload a photo, design or artwork. The standard photo jigsaw that is the plastic jigsaw puzzle got the edge because it is more firm and stronger than the puzzles made from cardboard. We use 2mm thick plastic for the puzzle to ensure that whatever our customers buy is strong and got the best quality. So, don’t worry about a little bit of extra money you invest on our standard photo jigsaw because we only offer the best quality of puzzles for kids and adults, and we offer six different innovative kinds of a plastic picture puzzle. All of the kinds have different piece counts so that it can meet our customer’s demand. It will bring an ease and convenience to use. The best part is you can easily modify and personalize the plastic picture puzzle by your own photos, artwork and designs. Use The Puzzle as Your Marketing Tool! Keeping in view importance of the marketing in today’s competitive world, puzzles can be an effective promotional tool for your business. You can design your own puzzle and spread it out in the market. This innovative marketing tool can for sure drive traffic towards your business. Plastic Photographic Jigsaw puzzles; Ideal for Kids and Adults Alike! Plastic picture puzzles are quite ideal for kids due to their strength and resilience; they cannot be broken into pieces by kids while playing. The puzzles are layered with the water resistant material which makes them hydrophobic. So, either your children are playing it in the swimming pool or on the bed; you do not need to get worried about any damage because they will remain intact.